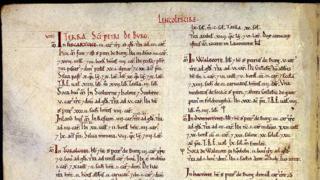 The Domesday Book is to be exhibited at Lincoln Castle over the summer. The document will be on loan from May to September from its permanent home at The National Archives in London. It was commissioned in 1086 by Norman king William the Conqueror after his invasion of England and lists the taxable value of his new kingdom. Jeff James from The National Archives said he was "delighted" the book was heading to Lincoln to be displayed alongside other historic documents. "There simply is no other document like Domesday," he said. "It is our nation's earliest, most important and most treasured public record, a work of the greatest historic significance. "It offers an insight into life and society in England more than 900 years ago and just as importantly it still has the power to engage and inform us today. The castle is home to one of four remaining copies of Magna Carta, a document outlining basic rights which was signed by King John in 1215.